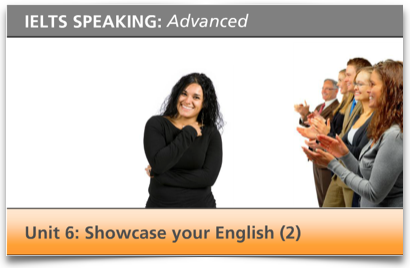 In addition students can test their knowledge of useful topic vocabulary, key areas of spoken grammar and evaluate recordings of advanced level students attempting IELTS-style Speaking tests. I will definitely recommend it to my students interested in taking the exam. Extremely helpful! Your new learning tool is very useful for both students and educators. It highlights the typical problems of candidates and gives clear examples, explanations that help students to be more aware of these issues during the preparation. The media tool is attractive and easy to use so working with it was a pleasure. I think it’s fabulous! I’m really impressed with the lesson I’ve just done…You are doing such a wonderful job to help us with English…THANK YOU!! !